For many Venezuelans, the choice is between going to work in exchange for a few bolivars a day, or looking for less and less products that are sold at controlled prices to be resold on the black market; taking into account that a bus ticket can be worth a full salary. In Venezuela, devaluation has made it more expensive to go to work than it is to stay home. Instead of paying for the transportation, clothing, and food they can’t afford, many Venezuelan employees prefer to simply leave their jobs. The same applies to university students, who see the effort of studying as”uphill” since their income can’t cover the cost of studying. 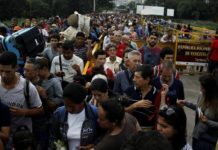 A report by AP shows that many Venezuelans decide to not go to work to in an effort to save money. Quitting, it turns out, allows them to stretch their saving longer towards the end of the month; especially those who earn a minimum wage. Es tan grave la situación en Venezuela que muchos venezolanos no van a trabajar porque si lo hacen pierden plata. Solamente salir a la calle significa un gasto enorme. “The situation in Venezuela is so serious that many Venezuelans do not go to work because if they do, they lose money. Just going outside means a huge expense” said Hugo Santaromita, a popular radio host, and political analyst, in a tweet. Taking into account that a bus ticket can cost up as much as a full month’s salary, for many Venezuelans the choice is between going to work in exchange for a few bolivars a day or looking for products that are sold at state-controlled prices. For many, abandoning their professions and taking up side jobs is more profitable than making use of university degrees. 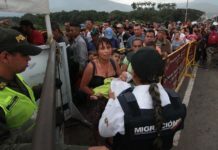 A significant number of Venezuelans choose not engage in any type of productive activity and subsist at the expense of some type of government grant. The integral daily income, equivalent to 26,583 bolivars (USD $ 0.13), barely covers the purchase of a cup of coffee. In Venezuela, the minimum wage is 248,510 bolivars (USD $ 1,2) and food vouchers are worth 549,000 bolivars (USD $ 2,7); a total of USD $ 4 monthly income. A basket of basic needs for a family exceeds 25 million bolivares (USD $ 125). Unsurprisingly, the situation has also decreased university enrollment. “I decided to stop teaching at the university, my salary is very low, public transport is very expensive and students are not even attending”; said Andrea Vargas, university professor, to the PanAm Post. Estar en la UCV y escuchar a los chamos: Quiero graduarme lo mas pronto posible para emigrar, en vez de escuchar: Quiero graduarme pronto para trabajar en una buena empresa. Realmente es triste como se desangra el pais no de dinero, si no Jovenes que son el futuro de Venezuela. In a tweet, a university student said, “At the UCV you hear kids say: I want to graduate as soon as possible to emigrate, instead of hearing: I want to graduate soon to work in a good company. Vargas pointed out how difficult it has become to be a professor in Venezuela because the salary is very low and the student atmosphere deteriorates more each day. I do not have the strength to convince people to continue studying with this situation in Venezuela. This semester I witnessed how students decided to leave because they were hungry, or because they did not have cash for transportation; others left their studies halfway because they aspired to leave the country, and others prefer to work in order to survive. How can I convince them to continue? She added that the quality of education also deteriorates because there is no way to require students to do special work; “Everything is a lot of money”. Rondon continued by saying that, “life as a student has become difficult, you do not even have access to cash to pay for a ticket, a bank teller only gives 10,000 bolivares and the university’s special transport charges 12,000 bolívares per day, they do not accept a bank transfer. It is difficult to buy food and paying for tuition is practically impossible. Being a student in Venezuela is an odyssey”. Under Nicolás Maduro, the country’s minimum wage has dropped to the lowest purchasing-power in all of Latin America. Workers and young students who depend on that income are finding it impossible live off of it. The reality is that, in Venezuela, for a family to eat properly, they must earn each day the equivalent of a minimum monthly salary; an impossible task anywhere. One has to ask oneself, how do parent keep their children well fed, pay for their studies and health expenses? How can a teacher, a student or a worker survive this Venezuela?